Please call owner Bill at 440-223-2412. This is a pristine example of this model Tartan. Lion Heart has spent its life in fresh water, within 50 miles of the factory where it was built. It has been constantly updated and is better than new. Engine- 3 Cylinder 43 HP Turbo Volvo Diesel w/700 hours. Electrical Mechanical: PYI Maxi-Prop 3 Blade Feathering Prop. Raw water pump – New 2019. Hot water heater, 110 volt with engine heat exchanger. Electronics: Raymarine E80 Multi-Function Display Radar Chart Plotter with GPS. Raymarine speed, depth, wind instruments. New Horizon VHF with RAM mike in cockpit. Tanks: Water capacity – 77 gallons. Fuel capacity – 36 gallons. Galley: 3-Burner gimballed CNG stove with oven. 2 CNG tanks. Double stainless-steel galley sinks – 9” deep. Top & bottom load ice chest w/freezer. Head: Electric Head with “Y” valve and 16 gallon holding tank with deck pump out. Shower fixture in head with drain to sump. Forward V Berth with private vanity and H&C pressure water. Guest double berth aft cabin. Head is located aft and to port. Nav station is forward facing between the head and settee on port side. L-shaped galley is located to starboard. Custom two-wing dinette table and storage. Equipment: Flag, Blue Awlgrip Hull - 2007. Webesto 16000 BTU air conditioning – New 2011. Waeco Refrigeration,12 volt - 2010. All standing rigging and babystay replaced in 2007. All new Rayco bimini, dodger, fly connector and frame – 2015. Reglassed main hatch – 2013. 2 Dacron Mainsails w/Dutchman system (2005 & 2015). 2 Genoas (2005 & 2015). 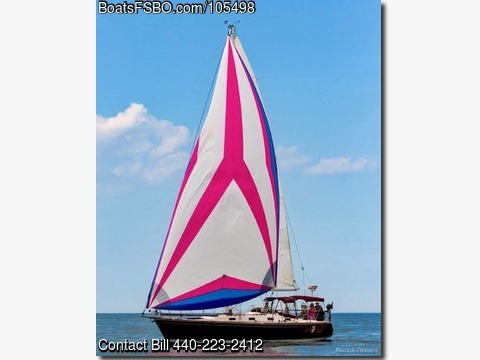 Mainsail cover – New 2016. Double lifelines (shroud s/s wire) with opening gates – New 2016. New main salon interior cushions – 2016. Dometic Electric MasterFlush toilet – New 2016. Raymarine autopilot – New 2010. Battery charger – New 2019. 2 Lewmar size 52 two-speed self-tailing primary winches. 1 Lewmar size 40 self-tailing mainsheet winch. 2 Lewmar size 30 halyard winches. 7 Halyard stoppers Garhauer rigid boomvang. Harken MK II roller furling system with Schaefer furling line blocks. Harken mainsail ball bearing car system on mast and traveler. 3 Batteries. Danforth High Tensile HT 2500 Anchor and 2 rodes-one w/chain. Bose speaker system – 2 below and 2 waterproof for stern rail with AM FM CD Player. Manual cockpit bilge pump. 6 Opening hatches. 10 Opening ports with screens.